Kenyatta University and Syracuse University co-sponsored the 5th International Conference on Education, which was held July 19-20, 2017 at the Kenyatta University Conference Centre on the Kenyatta University campus. 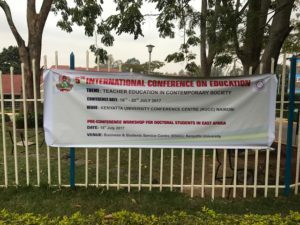 More than 80 faculty members and graduate students participated in the conference, which had the theme of “Teacher Education in Contemporary Society”. This entry was posted in International Conference on Education. Bookmark the permalink.